It’s tree planting time and a chance to plant, restore and protect natives that provide wildlife habitat and nourish the natural world. Here are ten of our favorite native trees and the benefits they provide for a whole host of species. A monarch resting on an eastern red cedar. Photo by National Wildlife Photo Contest entrant Sara Fenwick. Red cedars, which are actually junipers, are real workhorses for wildlife. The evergreen offers birds and other wildlife year-round cover from predators and bad weather, along with places to rest, roost and nest. Cedars produce berry-like cones that provide food for birds from early summer through winter. And more than 30 native moths and butterflies, such as the Juniper Hairstreak, lay their eggs on red cedar trees. Find out more about red cedar and other junipers. An eastern bluebird on the lookout for caterpillars on an oak. Photo by National Wildlife Photo Contest entrant Lisa Culp. Beautiful, robust oaks are host to more caterpillars than any other tree. 532 species of caterpillars thrive on oaks, providing important nutrition needed for bird breeding success. Birds and other mammals also feed on the hard covered fruit produced by oaks, the acorn. Read more about the wildlife benefits of acorns and oaks. A bull moose grazing on willow. Photo by Alan Vernon/Flickr. Willows are among the first trees after long winters to flower and provide nectar from long, tube-shaped catkins for pollinators like native bees. Beavers and grazing animals such as elk and moose browse on the fine textured willow leaves in summer and willow twigs winter. An egret resting on a mangrove branch in the afternoon sun. Photo by National Wildlife Photo Contest entrant Gerald Klein. Mangrove ecosystems—with their ‘walking’ root systems—are important habitat for at least 1,300 species of animals including 628 species of mammals, birds, reptiles, fish, and amphibians. Species that depend on mangroves in South Florida include the Florida panther, Key deer, Lower Keys rabbit, West Indian manatee, American crocodile and bald eagle. Read more about Red Mangroves in Florida. Mountain lion in a ponderosa pine. Photo by National Wildlife Photo Contest entrant Brenda Linskey. Ponderosas can be found from the plains states on westward, and grow from sea level all the way up to 10,000 feet in the mountains. This tall,coniferous pine produces seeds in prickly, furrowed cones that provide a source of food for birds and small mammals. Ponderosa are also used as cover and shelter by larger animals such as deer, elk and bears. Screech owl in a beech tree cavity. Photo by National Wildlife Photo Contest entrant Bill McMullen. Beech mast, or nuts, are eaten by a variety of birds and mammals, including mice. The nuts are rich in fat, allowing many birds and mammals to build up fat reserves that help them survive the winter. Squirrels, chipmunks, black bear, deer, foxes, ruffed grouse, ducks, and bluejays all feed on beechnuts. The trees are long-lived, which increases the probability of natural cavities that numerous wildlife such as squirrels, raccoons or birds use for shelter. A Red-spotted Purple butterfly on a black cherry tree. Photo by Mary Keim/Flickr. 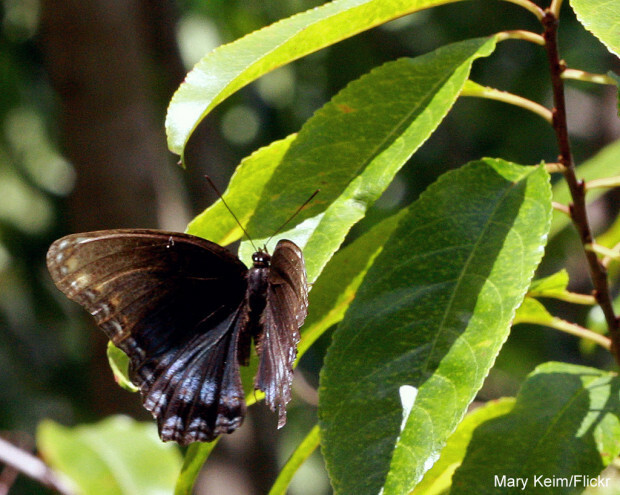 Leaves on native cherry and plum trees provide food for the caterpillars of butterflies such as Red-Spotted Purple, Coral Hairstreak and Tiger Swallowtail and spring blossoms are where native bees find early nectar. Songbirds and gamebirds eat the fruit, along with black bears, foxes, chipmunks, squirrels, raccoons, and mice. Longleaf pine with a red-cockaded woodpecker nest cavity. Photo by Mary Keim/Flickr. Found only in the southeastern United States, longleaf pine forests are home to hundreds of different plants and animals, with as many as 50 species of wildflower, grass, shrub and fern in a single square yard of the forest’s open, sun-bathed floor. Some researchers estimate that the longleaf pine ecosystem is one of the most diverse outside of the Tropics. Longleaf pine trees can live for over 300 years, and may take up to half that time to reach their full size. Over 30 endangered and threatened species, including gopher tortoises and red-cockaded woodpeckers rely on longleaf pine for habitat. Red tailed hawk perched in a cottonwood. Photo by National Wildlife Photo Contest entrant Robert Stahl. Dark furrowed bark and heart-shaped leaves that turn golden yellow in the fall are hallmarks of this riparian tree found in the West. Beaver use cottonwoods for making dams and lodges and eat the bark for food. Rabbits, deer, elk and moose feed on shoots and stems. Raptors often use cottonwoods for nest sites. Once cottonwoods start to die, cavities in them are used by over 40 species of animals for nesting or roosting. Hollowed out trees are used by hibernating bears and sometimes bats. A golden-mantled ground squirrel makes use of a fallen tree. Photo by National Wildlife Photo Contest entrant Heather Moore. Dead trees provide vital habitat for more than 1,000 species of wildlife nationwide! The two most common types of dead wood you’ll find in your yard, along a trail or at a park are snags (upright) and logs (on the ground). Salamanders, snails, beetles, ants and other insects are often found underneath fallen logs, while chipmunks and squirrels may use them to hide in or behind. Read more about how wildlife use fallen trees. National Wildlife Federation affiliates along with schools, cities and other partners across the country will be planting almost 25,000 native trees to help provide habitat for wildlife and regreen communities during the next few weeks. This Earth Day, we’re celebrating the support from friends of wildlife like you that makes the trees for wildlife plantings possible.